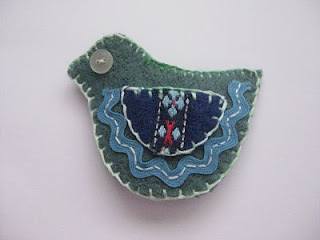 Would you like to win this super cute bird brooch? It's hand sewn by me, especially for the Sew Mama Sew giveaway! For you chance to enter, just fill out the Rafflecopter form below, you have multiple chances to enter. International entries welcome. Good luck. I'm guessing I should comment about this cute brooch! I would pin it to my winter coat later in the year but for now I would it pin it to my bag!! thanks for this chance to win and aren't you the early bird? I follow you by RSS so that's how i learned that your giveaway had already started. This is so cute! If I win her, she'll go directly to my mother-in-law who loves birds. I think she would make my MIL a very lovely brooch. Sweet little birdie brooch will be lovely on my work bag for the summer and my denim jacket in the fall! a lovely give away, thankyou. I love your bird, and it would definitely find a home on my blouse or scarf. Or maybe she would be a love gift to a friend for their birthday. Paying forward your generosity. Thanks for the giveaway. such a gorgeous little brooch! love love! this is perfect for my winter wool coat that is a heather brown with a big lapel, specifically for brooches! I love them! The lovely birdie would probably find a home on the lapel of my denim blazer. I would absolutely LOVE to win the bird. That's the cutest thing ever. Thanks so much for a chance (two chances!) to win. You are such a talented stitcher! Birds are one of my favorites things and yours is lovely. I would wear it proudly! Thanks for the giveaway...the brooch is lovely! Adorable brooch! I wonder if my kids would let me wear it, or if they'd steal it right off of me? I would just adore wearing this broach for all to admire if I was lucky enough to win it. I have an affinity for birds, they represent life, power and bravery to me. I would love to win this pin, it would mean a lot to me. Thank you for participating and for the lovely prize you are offering. i love this little brooch! I can imagine it pinned on my handbag! Absolutely lovely brooch, I'd love to win. Thank you for a chance! I think I'd add this to my favourite tote! What a gorgeous birdie. It'll make such a cute magnet for my craft room or a great little pin. SO cute! That is a sweet little bird. So very sweet, count me in! Such a sweet little broche and it would look divine on my sweater or attached to my handbag. This is such an adorable bird! I would pin this on a scarf or on a handbag. Thank you so much for the chance to win! I would love to wear this little bird on my jacket! This little bird is so adorable! Thanks, I am so flad to have found your blog! Ah, she is so cute! I would definitely pin her on this cute little felted hat I got at the street fair a couple weeks ago. Thanks for the giveaway! Love it, too cute! Thank you for your giveaway! So cute. I would pin it to my handbag for sure. I have two wool winter coats, one red and one black, that I think this brooch would look cute on. Until the winter I would probably pin it to my purse or knit a light scarf to attach it to. Thanks for the giveaway! I love birds!Could this fly to Greece?AriadnefromGreece! This little birdie is so sweet! Love the bird brooch. I would gift it to my mom (although it would be hard not to keep it!). A handmade original is always the most precious, thanks for the giveaway. I'm hosting a giveaway on my blog for a pair of handmade earrings- please stop by! That birdie is so cute! I'm looking forward to doing some handsewing myself this summer. And I do have a weakness for birds. Thanks for the giveaway! Thanks for a chance to win. My mom would love this little bird. I love the little bird and would pin it to a pretty carry all. he's so cute! i'd give him to my mom for her bird christmas tree!